Encuentra asistencia y herramientas específicas para tu Verizon Ellipsis 8 HD en Internet. El Verizon Ellipsis 8 HD incluye 24 meses de asistencia ilimitada con Tech Coach, sin costo adicional. Mira cómo Tech Coach puede ayudarte a resolver prácticamente cualquier pregunta. If you had a Google account on your Ellipsis 8 HD prior to completing a factory reset, view this info. 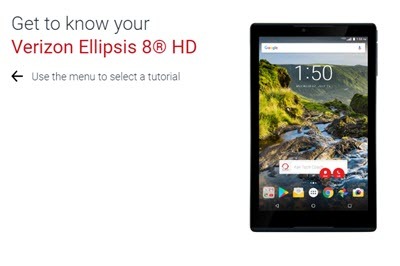 Here's how to complete a quick setup of your Ellipsis 8 HD tablet. Conoce tu nuevo Verizon Ellipsis 8 HD con esta guía de consulta rápida. Here's how to turn off Android Device Protection for your Verizon Ellipsis 8 HD. Here's how to turn Android Device Protection for your Ellipsis 8 HD tablet on. To transfer/move/upload picture or video files between your device and your computer or SD card, view this info. Here's how to sign in or out of additional user accounts set up on the device. Learn how to charge your Verizon Ellipsis 8 HD. An interactive map of the Home screen and buttons on your Verizon Ellipsis 8 HD. Learn more about the back of your Verizon Ellipsis 8 HD. Learn how to power on and shut down your Verizon Ellipsis 8 HD. Here's info on the battery specs (e.g., Usage Time, Standby Time, etc.) for your Ellipsis 8 HD. Here's how to improve battery life on your Ellipsis 8 HD tablet. Here's how to make your Ellipsis 8 HD tablet visible to Bluetooth devices. For additional common camera settings, (flash, timer, front / rear camera, etc. ), view this. Here's how to view your Ellipsis 8 HD screen on an external display (e.g., HDTV). If you can't transfer media between your Ellipsis 8 HD and PC, view this info. Here's how to restrict the amount of data an app uses on your Ellipsis 8 HD. To turn the mobile data for your Ellipsis 8 HD on or off, follow these steps. Here's how to correct the time/date on your Ellipsis 8 HD shows the incorrect date and/or time. If the color scheme on your Ellipsis 8 HD is reversed, view this. If the display on your Ellipsis 8 HD doesn't rotate, this shows how to fix it. To modify data usage options for the personal email account on your Ellipsis 8 HD, view this info. Here's how to delete multiple emails on your Ellipsis 8 HD. Here's info on common personal email settings (e.g., account name, etc.) for your Ellipsis 8 HD. If you're not getting notifications for the personal email on your Ellipsis 8 HD, view this info. To update the personal email password/server settings for your Ellipsis 8 HD, view this info. To enter or edit the personal email signature on your Ellipsis 8 HD, view this info. Here's how to update the work email settings for your Ellipsis 8 HD tablet. Removing then re-adding a work email account on your Ellipsis 8 HD often fixes email issues. Removing then re-adding a Gmail account on your Ellipsis 8 HD often fixes email issues. Removing then re-adding an email account on your Ellipsis 8 HD often fixes email issues. Here's how o change the Mobile Hotspot password on your Ellipsis 8 HD tablet. To turn Mobile Hotspot on/off on your Verizon Ellipsis 8 HD or if you can't connect to Wi-Fi, see this. Here's how to turn on and customize the Smart Lock setting on your Ellipsis 8 HD tablet. To unlock the screen on your Ellipsis 8 HD, check out this info. Here's how to set up facial recognition to unlock the screen on your Ellipsis 8 HD. To disable the screen lock setting on your Ellipsis 8 HD, check out this info. A visual guide for setting screen security on your Verizon Ellipsis 8 HD to help protect your private information. View this info on memory card formatting options for your Ellipsis 8 HD. A factory reset on your Ellipsis 8 HD helps with a blank or frozen screen or calling, app, audio and sync issues. Here's how to upgrade the software on your Quanta device if the software update failed. Si necesitas ayuda o asistencia para actualizar el software de tu dispositivo, o si la actualización de software no se realizó, esta información te ayudará. Here's how to install the Quanta Ellipsis Upgrade Assistant on your laptop or computer. To check for or to install software updates on your Verizon Ellipsis 8 HD, view this info. To view the software version your Verizon Ellipsis 8 HD is running, check out this info. Find out how to insert and remove a nano SIM card from your Verizon Ellipsis 8 HD. Discover how to put and remove a microSD card into your Verizon Ellipsis 8 HD to add memory for photos, videos, music, documents and more. Here's how to use Wi-Fi Direct so you can easily connect your Ellipsis 8 HD with other Wi-Fi capable devices. Here's how to allow your Ellipsis 8 HD to auto switch between Wi-Fi and mobile data. Here's how to view the Wi-Fi network that you may want to add to your Ellipsis 8 HD if it doesn't display. To remove a saved Wi-Fi network from your Verizon Ellipsis 8 HD, view this info.